The model travelled to Scotland by ferry in 16 bespoke crates after being on display in Belfast. The Natural History Museum's famous dinosaur, Dippy the diplodocus, has gone on display to the public in Scotland for the first time on Tuesday. 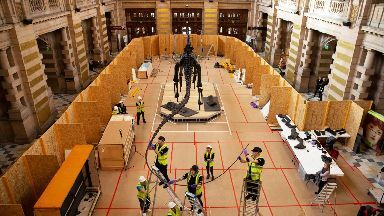 The giant model dinosaur skeleton is on display at Kelvingrove Art Gallery and Museum in Glasgow as it approaches the halfway point of its three-year tour of the UK. Members of the public will be able to view the Jurassic giant on the only Scottish stop of the eight-city tour until early May. Lorraine Cornish, head of conservation at the National History Museum (NHM) in London, said: "Dippy, I think, is the people's dinosaur - a true rock star. We're so delighted and privileged to be able to tour Dippy around the UK." The replica cast, which is made from plaster of Paris and resin, is an example of the Diplodocus carnegii species that lived between 145 and 156 million years ago and roamed North America. Councillor David McDonald, chair of Glasgow Life, said: "Dippy has arrived. There is a wonderful sense of excitement surrounding the biggest thing to arrive at Kelvingrove Museum - quite literally - this year. "Like thousands of other visitors, I can't wait to see this impressive creature up close. I believe that seeing Dippy first-hand is certain to inspire the next generation of conservationists and to encourage families to explore nature on their doorstep." Dippy is on display at the Kelvingrove until the first week of May. Admission is free and unticketed, although visitors are being asked to leave extra time to see Dippy during weekends and school holidays. On Tuesday, schoolgirl Emillie McQuade got the chance to add the last bone to the model before it went on public display. The 11-year-old, from Sunnyside School of Conservation, in Craigend, Glasgow, said she was "excited" to have the honour. She said of the structure: "It's massive, it's so big. It's a really good opportunity for everyone to come here and see Dippy." Once he leaves Glasgow, he will visit Newcastle, Cardiff, Rochdale and Norwich on the tour which finishes in October next year. The species is named after Andrew Carnegie, the Scottish industrialist and philanthropist who financed its excavation in Wyoming, US in 1899, and donated the cast to the Natural History Museum (NHM) in London. It was on display in Hintze Hall of the NHM from 1979 until January 2017 and, before the tour, the dinosaur had never been on public display outside of London. The 21.3-metre skeleton cast arrived at the centre hall of the Kelvingrove earlier this month after sailing across the Irish Sea. The model travelled to Scotland by ferry in bespoke crates after being on display in Belfast. In recent days, experts have been working to unpack the 292-bone structure and undertake the giant "jigsaw" of putting the dinosaur back together, ready for display. 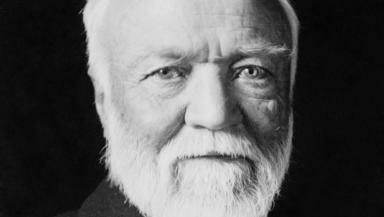 Andrew Carnegie: Financed excavation in 1899. Ms Cornish said: "Dippy goes into 13 packing crates and there are four more crates which have the base in. It takes two-and-a-half lorries to transport Dippy. "When he comes in there's a team of six from the NHM, plus we've had amazing technicians here to help take all of Dippy out of the crates. "Although he's 292 bones he comes parcelled together in 86 parts. It takes five or six days to actually check Dippy's condition and then put Dippy together. It's been quite a team effort. "Some sections are very heavy and very fragile. 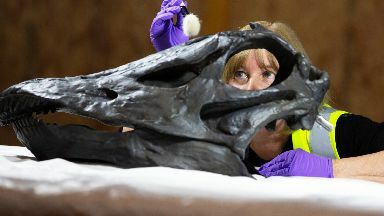 It's a bit of an art to actually put Dippy together and take Dippy apart."